Road Trail Run: New Balance Fresh Foam More Review: Much More of Everything! New Balance Fresh Foam More Review: Much More of Everything! 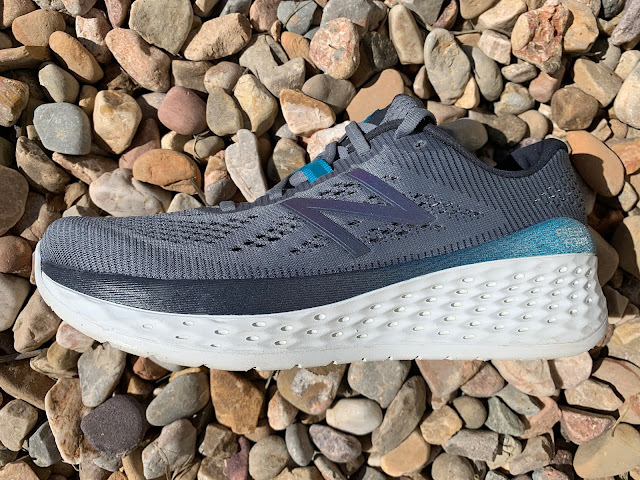 Sam: The New Balance Fresh Foam More is truly more of everything: cushion, stack height, and upper volume yet it comes in at an admirable weight of about 10 oz / 283 g in a size 9. To our knowledge it has the highest midsole stack and the broadest and highest volume toe box of any New Balance to date. Not enough room in this super roomy upper? New Balance will even be offering More in 2E and 4E wides for truly gigantic feet. It features a soft double Jacquard mesh upper to provide structure without overlays, a giant slab of Fresh Foam with laser engraved impact relieving holes as well as flex grooves below the sockliner, and a 5mm ground contact outsole foam outsole. Light and sitting on a broad stable platform with a snappy responsive feel, which is clearly not marshmallows, it offers a distinct new more maximal running shoe option. Cost. $160 is a lot of money, even if it is becoming a more common price point. Upper is maybe a bit overbuilt. I really like this shoe, so I’m reaching even to nitpick it. Jeff is the token slow runner of the RTR lineup as such his viewpoints on shoe and gear can differ from those who routinely finish marathons in three hours or less. Jeff runs 40 miles per week, both roads and desert trails in north Phoenix, Arizona. He has a PR's of 4:07 marathon and 5K at 23:39 both he is working to demolish with help from his coach and fellow RTR tester Dave Ames. Jeff - “Somebody else made a Bondi” was my immediate reaction. It’s hard not to see the similarities between the Fresh Foam More and Hoka One One’s massive road trainer, in its version 6 coming in at 0.8 oz heavier than the More. That said, New Balance went to school to avoid some of the pitfalls that plagued early Hoka releases, most notably (and sorry, but I’m going to keep ringing this bell) a toe box that most runners will be able to wear at length without issue. That’s been the biggest Hoka issue for year - they’ve created a shoe ideal for going long distances, but the fit was finicky enough to create issues for running at length. The Fresh Foam More, or FFM, does not resemble the wide front end of Altra or Topo, but is very much in line with what is traditionally considered a wide toe box. As for the fit? I tested a true to size 10.5D, and it was spot on for length. I would not advise sizing up. New Balance offers this shoe in both a 2E and a 4E, so truly wide feet will have a home. However, and I’ll elaborate more in the section on the upper, I would not entertain going with a wider option unless your feet are actually approaching Hobbit proportions. Peter-”Somebody else made a clifton” was my reaction! I was super excited as I’ve had to run in Hoka lately due to a foot injury that’s kept me out of any shoe with any real flex. I was hoping for a better fitting version of a Clifton. Hope: Is there an echo in here? I’m with the guys, but the Hoka I thought of was the Mach. High stack, firm but reasonably lightweight midsole (not Clifton 1 “how did they do that?” light, but plenty light), and a roomy upper. The navy and purple engineered mesh upper features some a couple of touches that speak to the premium quality of this $160 shoe, notably: clean lines from welded overlays and a textured rubber New Balance logo on the tongue. Sam: A gigantic silhouette at first glance but don’t be fooled, the foot sits about an inch down below the top of the midsole at its deepest point at the “Fresh Foam More” logo at the heel. I fit true to size here and as others have said no need to size up that is absolutely for sure. The fit is very voluminous not only for my wider left foot but for sure for my narrower right. I had to cinch down hard on the laces and wear slightly thicker socks to get a good fit and even them my narrower foot swims more than I like. I wonder if a woman’s version and last might not work better for me. To make the gigantic soft toe box and upper work New Balance uses with a vertical flexible plastic toe bumper stiffener (bunion sufferers should be very pleased) includes a fairly thick bootie at mid foot, firmly pads the rear collars including modular pads and embeds the heel down into the midsole. The pads are felt but with no issue for me but this is not the softest plushest feel around at the rear. Jeff - As much as I’m going to rave about this shoe below, the upper might be my favorite part of this shoe. New Balance used a plush mesh for the FFM, and while it doesn’t have much structure to it, the shoe doesn’t feel sloppy. Every part of the upper is comfortable from the heel counter to the partial midfoot bootie that holds the tongue in place. The heel counter is very flexible, but relies on the sidewalls of the midsole to give the shoe extra support in the rear. Four molded pods line the sides and heel, locking the foot down, but comfortably, not forcefully. The FFM uses what New Balance is calling “Tongue Wings” to help lock down the midfoot, and they do a well enough job. The tongue has some additional padding, which is good, because this shoe took some cranking to fit appropriately. My foot is barely on the wide side of normal, and I have my pair laced very tightly to hold onto my foot. As a result, the laces end up much too long. I can’t imagine how narrow footed runners would fare with the FFM, but I don’t want to knock a shoe too hard for a likely issue for other runners. The mesh is fairly open around the midfoot to the point of being able to see my sock through the upper, and closes up slightly toward the front. All of this leads to a very breathable shoe. The iridescent finish found several places on the shoe is a nice touch. 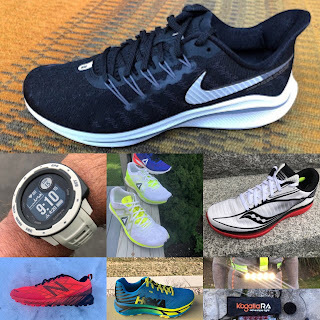 Peter: I will have less to say about the ride and midsole about this shoe than Jeff and others, because I may well never be able to run in it again after a recent 12 miler in them. To get the upper to hold my foot well I had to really cinch it down. So? What gives? Well, I’ll tell you...the ankle collar padding is broken into two sections on each side with a little space between them. Everything was fine for about 8 miles and then I noticed that the padding was digging into the sides of my ankles just below the bone. I think that the space between the two padded sections created pressure points at the beginning and end of the padding. The result being actual bruising just under the ankle bone that was excruciating and lasted for days. I’ve never had anything even remotely like it in all of my years of running. Unfortunately the ankle collar issue makes the shoe un-runnable for me. I’ll give them another try at some point--but not for longer mileage (which sort of defeats the purpose of this shoe for me). This may be partly due to what Jeff pointed out above I did have to cinch the shoe very tightly to get it to hold my foot well. Perhaps if the upper fit a bit more snug I wouldn’t have to lace it as tightly. Hope: My impressions of the upper land more on the Jeff side of things than the Peter side of things. The upper feels roomy for my “normal” width foot (My regular size is a M8D or a W9.5B and I never yearn for narrow sizes), but lockdown is good enough that I didn’t have to really crank down on the laces or use the heel lock lacing technique. I think the structured heel cup contributed significantly to the fit for me. The notches that gave Peter such trouble remind me of the heel cup of the Nike Vomero 14. Instead of a smooth heel lining, stuffed nodules in the heel add texture that can grab the heel and lock it in. With so much potential for sore spots in any shoe, intentionally adding a textural element that will come in contact with the foot seems counterintuitive. That said, I don’t mind this treatment in the Vomero 14 and I don’t mind it in the FFM. Do I like it better than I’d like a smooth heel cup? Hard to say as the FFM is a new model. It’s the kind of feature that can give some runners problems, so it’s at least something to be mindful of as you consider this model if you have sensitive heels. I appreciate the accommodating yet structured upper. I remember running in the Hoka One One Conquest back in 2013 (I think this was back when they were Hoka Oh-nay Oh-nay instead of Hoka 1-1!) and feeling like the upper with its string laces wasn’t quite enough to balance out the burly midsole. Max cushioning shoe tech has come a long way since Hoka pioneered it. The FFM’s upper is comfortable and secure. With many more millimeters of foam underfoot, solid lockdown is critical. You wouldn’t want to walk, much less run on loose stilts, would you? Same principle. I didn’t notice any benefits from the tongue design Jeff mentioned. The rubber treatment maybe helps keep the tongue centered, but it strikes me as a component that adds weight and cost to the shoe -- a lace loop on the tongue could do the same job. Sam: As covered by the Hope and Jeff, the upper is superb in its front comfort but is at edge of to roomy for me particularly on my narrower right foot. Also at the edge, that ankle collar and modular pads. The rear collar padding stand in contrast to the front upper feel in being firm and stiff to the softness of foot hold up front but they work. This is an upper which should accommodate aftermarket orthotics assuming the down low mid foot width with the bootie has enough stretch. Jeff - The big departure of this shoe from its brethren is its midsole. More than 30mm below the foot is nothing short of substantial, but unlike other brands’ offerings, the Fresh Foam More is very bouncy. Will all that Fresh Foam you might think it the result would be a mushy, but it is anything but. The FFM is very clearly the big brother to the 1080v9, which has a similar cushioned and bouncy ride to accompany the laser-engraved sides of the midsole. Peter: I agree with Jeff, the midsole is way less mushier than you might think it would be. It’s pretty firm actually (for the size of it) and provides some nice energy return. Hope: I agree with Jeff and Peter. New Balance did something brilliant here: they made a max cushion feel soft without making the midsole itself overly soft. The FFM features a 100% Ortholite insole. We keep mentioning the brand with the bird logo, and with good reason. Hoka pushed (and continues to push) the running shoe industry to innovate shoes with increasingly high cushioning to weight ratios (plainly: more cushion for less weight). My OG Clifton 1 shipped with two insoles: Ortholite and traditional EVA (I opted for both when using them for my first 50-mile finish). Ortholite is squishy soft and provides step-in comfort. This squish gives the FFM a soft feel without sacrificing stability because the midsole can remain relatively firm. I love how snappy the FFM feels. It definitely feels like a relative of the 1080v9 -- a trainer that’s sneaky-fast despite its unpretentious looks. I’ll add that in the FFM the midsole also contributes to fit. The midsole walls extend up the foot for a bucket seat effect. Sam:I was not always a fan of early Fresh Foam midsoles such as in the Boracay or of the overall midsole/outsole designs. I found these shoes stiff, dull and harsh. Neither am I fan of the marshmallow softness and instability of the early Cliftons and nearly so in early Skechers Ultra Road. In the More, the Fresh Foam in combination with the wide on the ground platform, the laser cut side cavities, flex grooves upfront under foot and the relatively soft ground contact outsole produces a feel which I would describe as consistently responsive in nature and through the entire stack. No sense of a firmer outsole paired to a softer midsole or any disconnect between forefoot and heel cushion feel or even amount of cushion front and back. Jeff - Over the last few years, many shoes have abandoned full rubber coverage outsoles to save weight or increase flexibility, but New Balance kept it traditional with coverage, albeit ground contact foam and not traditional rubber. The result is great traction, and likely impressive durability. Also, the shoe has a number of flex grooves that keep it from feeling too stiff - but the midsole thickness keeps it from being very flexible. For some reason there is a convex pocket underneath the heel. Besides showing a runner what the outsole looked like when it was new, I’m not sure I understand its purpose. I am shocked, in a good way, that the “rubber” outsole is New Balance’s Ground Contact midsole material. That’s very impressive, especially when you look at wear patterns compared to other offerings that go a similar route. Peter: Just to add a bit to what Jeff said--there’s also an increased thickness of rubber on the medial side of shoe towards the heel which I imagine provides some level of stability and prevents rolling in for heel striking pronators. Hope: Hold up! This outsole is the Fresh Foam Ground Contact compound. I think it speaks well for the durability and feel of this material that the guys first mistook it for rubber. New Balance has upped the impact and abrasion resistance of FFGC so it doesn’t compress or shred -- it’s as good as rubber, but without the added weight. There’s almost no flex point to speak of in the FFM, but the application of a foam outsole instead of rubber allows this high stack height shoe to flex as much as possible. As a continuous 5mm thick slab, with the addition of the medial rear raised stabilizing plug as Peter mentions, it only has shallow grooves between the pentagonal lozenges, reminding more of the earlier Fresh Foam outsoles than more recent ones such as the excellent 1080v9’s where flex grooves through the outsole really assist in transitions and toe off. I wish for a more segmented outsole up front and deeper grooves that is for sure. Jeff - The FFM fits the Swiss Army Knife/Jack-of-all-trades role very well due to its unique ride. It is a very bouncy, but well-cushioned shoe. I ran in them for a variety of runs, and in each one they excelled. Not a surprise that the FFM is a great long slow day shoe, or even an ideal shoe to wear the day after a hard run. But, I wore them during a particularly brutal speed workout with hill repeats followed by intervals and shockingly, they were great. I found the high stack to be stable enough (likely a combination of the width paired with the high bathtub like side of the midsole) to push, and the bouncy rebound of the massive (but not heavy) midsole worked well. It won’t be my go-to speedwork shoe next week, but if I was taking a trip and only had room for one pair of running shoes in the suitcase, the Fresh Foam More would be near the top of the list. Peter: I have less to say here due to inability to do multiple runs in them. My main feeling was that they are a decent shoe for long runs (if you don’t have the ankle collar issue) but that they could use a bit of adjustment in the ride--and would be better if they rolled just a bit easier through toe off. Hope: I ran easy to moderate miles in the FFM, with the longest run topping out at 10 miles. Very easy on the legs. I want to say that they’re bouncy since there’s nice rebound from the Fresh Foam, but the ride is so smooth that it doesn’t seem like the right word! It didn’t occur to me to try them for speedwork, but I can see how they’d be enjoyable there. The shoe is soft and forgiving, yet still stable and snappy. Sam: The ride is incredibly well cushioned yet at the same time “responsive”. By this I mean a firm consistent slightly bouncy rebound and neither a soft sinking and then spring or a harsh shock transmitting landing. There is zero harshness felt with the reward of a consistent, responsive, stable, shock free ride, if one that due to the overall stack and stiffness lacks some road feel. The ride is I think somewhat held back by the overall front stiffness of the shoe combined with lack of any substantial rocker making the toe off somewhat level and flat feeling, if otherwise dynamic, as Peter also felt. I found that as in early Hoka knee lift on toe off is important to get them to move up and away. I wish for a little less of an effort up front to move along. Jeff: This is a great shoe. The comfortable upper, paired with an outsole that gives you plenty of traction and durability with a midsole that blends cushioning and support very well - hard to find many faults there. A great easy or long day shoe, and a solid uptempo shoe, the Fresh Foam More brings a lot to the table. It’s upper is soft and supportive, but runners with narrow feet may have issues locking the shoe down. The massive midsole is firm enough to provide a stable platform, but gives the shoe a bouncy ride, especially when you push pace. -.1 Cost. $160 for a long lasting and well-cushioned shoe is becoming par for the course, but that’s still a very large amount of money. -.1 Upper Width. At the midfoot a D width shoe feels wider than most 2E shoes. Narrow footed runners will have to get creative with lacing. -5 fit issues and actual bruising at the ankle during the run make this shoe a no go for me. Narrow feet will struggle to get a fit. Others as my fellow reviewers were may be just fine. -1.0 The ride is a bit flat and could roll better to toe off. Hope: I have a new favorite maximal shoe. The FFM puts its own spin on max cushioning by using a midsole compound that does two things: of course the thick slab of Fresh Foam cushions joints from impact, especially over long efforts, but it also provides some energy return because the midsole isn’t so soft that it deadens each footstrike. -.1 for looks -- the engineered mesh upper is a great canvas for some better colors beyond the few available at launch. The huge expanse of white Fresh Foam midsole doesn’t give the shoe much of an “I run fast” look. New Balance should have more fun with this model! Sam: The low weight, superb consistent, lively and incredibly well cushioned, stable yet neither mushy or harsh midsole (plus Ground Contact foam outsole) feel and ride are the big highlights for me. The upper is very comfortable but somewhat overly voluminous for my feet with tight lacing required. Higher volume feet and tricky toes should be very happy, and super high volume ecstatic as 2E and 4E wide are also available. The toe off needs work with either more of a rocker or more outsole flexibility, it just doesn’t flow as smoothly and easily as I would like. I agree with Peter that it is kind of flat, spoiling the otherwise lively ride’s final move. All of this said New Balance is to be commended for plunging into roomier, highly cushioned yet lively shoes which are at the same time very light in weight. -0.2 for overly roomy, somewhat hard to secure comfortably upper for narrower lower volume feet and even mine which are not that narrow. Heavier socks help here. -0.5 for overly stiff or inadequately rockered front of the shoe, harkening back to the original Fresh Foam outsoles which seemed more visual design statement than functional. New Balance has done better since in this area recently in the 1080v9 with flex grooves. Why not here? Jeff - No surprise that these two run very similarly. The FFM has a thicker, stiffer, and more cushioned midsole. The 1080v9 has a grippier outsole, an even more comfortable upper, and is slightly better at tempo. Surprisingly, they weigh nearly the same. Both are great do-it-all shoes. If you prefer a more cushioned ride, take the Fresh Foam More, if you like a more traditional running experienced, go with the 1080v9. Hope: I basically agree with Jeff. The 1080v9 is more flexible due to its lower stack height and it features a rubber outsole instead of Fresh Foam Ground Contact. I like both a lot, but as I prefer a traditional feel, I’d choose the 1080v9. Sam: The 080v9 forefoot midsole and outsole is far easier to move along and its upper more secure. If the More forefoot toe off and upper could be tuned, and I don’t think it would take much, I would prefer its overall ride feel as a long trainer but in the meantime 1080v9 is my preference. The FF More is more akin to the clifton 5 than it is to the Bondi. It’s not as heavy and ponderous as he Bondi—but also not as protective. If you need a brick S-house of a shoe and are a little heavier—or have more leg muscle than I do, you can probably turn the Bondi over just fine. Otherwise, if you don’t suffer the fit issues I did with the FF more, then you may want to give the MORE a try. The Bondi Rocker gives a little more flow, but the More is a good, lighter alternative. Jeff - The Nimbus is more than an ounce heavier, and rides much firmer. Unless you are morally opposed to wearing a maximally cushioned shoe, take the Fresh Foam More. Sam: Agree with Hope and Jeff the Nimbus is heavier and feels it. While much improved and simplified it still feels much more “complex” underfoot than the More. It does flex better though and its upper gives me no issues as More’s did. Sam: The Meta Ride has a similar firm, super well cushioned yet responsive ride feel. It too is a completely stiff shoe, It is a heavier shoe in weight and also in price at $90 more. It's upper will work better for medium to narrower feet. The accentuated forward rocker stands in sharp contrast to the flat forward profile of the More and allows an a far easier, if abrupt, fall forward to toe off. Jeff - Surprisingly these two shoes feel very similar underfoot. The thinner PU midsole of the Levitate 2 is much heavier, but as slow pace feels similar. That said, the Levitate 2 is roughly two ounces heavier than the Fresh Foam More, and does not have the same level of versatility. Sam: Levitate runs a touch better at slower paces as it is not as stiff but the weight difference is noticeable. Its PU midsole is more pneumatic in feel than the consistent somewhat firmer rebound of the More 's and its upper more secure if more dense and heavy. Jeff - The adidas shoe is an ounce more but is a very similarly performing shoe. The primeknit upper holds the foot better, but the Fresh Foam More’s mesh upper has more room in the midfoot and forefoot - for better or worse. If you are looking for primarily an easy/long run shoe, go New Balance. Otherwise, take the Ultraboost 19. Sam: The toe box and to a certain extent midsole of the More reminds me most of the Instinct, although Instinct is close to an ounce heavier Both have very roomy toe boxes made of soft foot mesh. The Altra has a similar feeling ride but is a bit firmer and of course lower drop at zero. Overall the Altra's fit is better executed and its front flexibility welcome allowing easier toe offs. Jeff - The Hit Parade of TPU based shoes that perform similarly to the Fresh Foam More (with a weight penalty) continues with Saucony’s big daily trainer. The Triumph is more than two ounces heavier, and even better for slow easy runs, but the Fresh Foam is echelons better at uptempo runs. Hope: The Triumph ISO 5 has more squish while the Fresh Foam More has more pop. For my money (and considering the sizeable weight savings) I’d choose the FFM. Jeff - Shockingly the Brooks is heavier even without a TPU midsole. Also shocking, the midsole is softer in the Glycerin, and the upper is softer (and holds the midfoot better). The Fresh Foam More excels at faster runs, and while not as soft as the Glycerin, feels better during long slow runs. Both solid shoes, and if you are looking for one shoe for all, take the New Balance. If it is going to be part of a rotation, get the Brooks. 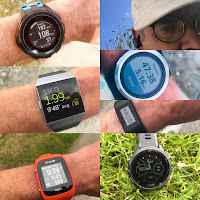 Sam: Much as with the Triumph, the Glycerin 17 is my pick over More for slower to moderate pace runs with the lighter more responsive More for faster paces. As for the upper, the front of the Glycerin upper is denser and lower volume but still roomy. Its ankle collar and achilles far more plush than More so overall it has a more balanced consistent fit from heel to toe and a more secure one. Great review think the Bondi 6 2E/Challenger 5 2E are my go to.. The inexpensive Reebok forever floatride, will there be a Multi-tester review? Thanks! Planning more voices to join our initial Forever Energy review, linked below. I can say if you are 2E in most shoes they may be too narrow for you, unless maybe used as a racer fast workouts shoe. Any thoughts on how this compares with the forthcoming Skechers Maxroad 4 Hyper that you've been wear testing? I've really enjoyed New Balance's recent offerings, but it's a little hard to get "excited" about this shoe when the Skechers offers similar cushioning at almost 2 ounces less. I love the Maxroad 3 as my long run / recovery shoe, but probably need to replace soon. Ooo I'm excited about glycerin 17 - the 16 was purchased off the strength of your reviews, and it has been nothing but love from me. I really like the loft foam. It makes me laugh a lot to think about all the advocates of natural running who only few years ago thrashed their feet and legs running barefoot or with paper-thin soles because African runners could do so. Now watching the current state of the art I laugh even more. Can you please tell us how the fresh foam more compares to the skechers max road 4,since you have tried them both. Skechers Hyper Burst in the Ultra Road is lighter and for sure springier and more lively. Fresh Foam denser, firmer and more stable (more outsole also in the mix) . Ultra Road is also flexible which More is not. I laughed a lot and cringed then as I tested the first Hoka Mafate on the run and on a trek around the Mont Blanc. I laugh alot less about the current state of the art which is evolving in good directions towards a combination of light weight, dynamic cushion, and lively fast rides. Here it is close for me but not quite there due to the forefoot.